INDIANAPOLIS--(BUSINESS WIRE)--Anthem Inc. (NYSE: ANTM) today unveiled its new Innovation Studio in midtown Atlanta’s Technology Square. The studio is a state-of-the-art facility housing a multi-disciplinary team who will focus on creating new capabilities to enhance the consumer health care experience, improve the quality of care, and lower health care costs. Encompassing 6,500 square-feet, this open-concept office space will foster innovation by providing a collaborative environment that brings together industry leaders and technology experts. Anthem has established a sophisticated method for developing ideas and bringing them to fruition through a process of workshops and pitch days in which associates from across the company present ideas to be considered for development in Anthem’s innovation incubator. 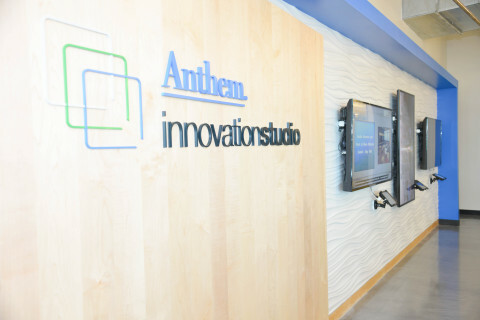 The Innovation Studio work will focus on further advancing Anthem’s three strategic pillars: consumer experience, managing the cost of care, and provider collaboration. Atlanta’s Technology Square is a well-known hub for innovation, with world-renowned Georgia Institute of Technology nearby, as well as research facilities, top-tier incubators, and a robust technology infrastructure. As the first Fortune 50 health benefits company with an innovation center in Technology Square, Anthem will be able to tap into Georgia Tech’s existing research and technology, cultivate strategic relationships, and develop opportunities for collaborating with other technology and innovation companies in the area. Anthem is working to transform health care with trusted and caring solutions. Our health plan companies deliver quality products and services that give their members access to the care they need. With over 72 million people served by its affiliated companies, including more than 39 million enrolled in its family of health plans, Anthem is one of the nation’s leading health benefits companies. For more information about Anthem’s family of companies, please visit www.antheminc.com/companies.